A year after Miyazaki’s swansong, the final bow of his Studio Ghibli partner Isao Takahata. A review by Indy Datta. One day, in medieval Japan, a bamboo cutter sees a celestial light glowing from inside a bamboo stalk. Cutting the bamboo plant open, he finds inside a tiny princess, no bigger than the palm of his hand. He takes her home to his wife, whereupon she transforms into a normal sized baby girl, albeit one subject to surprising instantaneous growth spurts. The childless couple bring the girl up as their own, calling her Princess. The bamboo cutter finds gifts of gold and rich silks in other bamboo plants and is convinced that his new-found daughter’s destiny is to become the princess he first saw her as. The girl herself has no airs and graces. For a year or so, until she’s outwardly on the cusp of her teens, her life is idyllic and unassuming, measured out in long days exploring the countryside around her village with the friends who call her not Princess, but Little Bamboo. As adolescence approaches, her parents move to the capital so that she can be schooled in the ways of noble women (grudgingly accepting the physical restraints of formal dress, plucked eyebrows and blackened teeth and the alien social restraints of ladylike behaviour), take her formal name, and entertain the suits of noble men. Five particularly noble suitors come to her, each comparing her to a different mythical treasure, and she promises (in the hope that they will fail) that she will marry the one who can bring to her the treasure he named. Up to this point, Takahata’s film has been, while never not engrossing, fairly predictable. Both the depiction of Little Bamboo’s bucolic childhood and her guileless spunkiness, which grows into a calm moral gravity, are tonally familiar from, for example, the films of Takahata’s Ghibli stablemate Hayao Miyazaki. What’s very different is the aesthetic. Takahata, as is his custom, was not the lead draughtsman on the production of Princess Kaguya (the credited directing animator is Osamu Tenabe), and the film’s look is very different to anything Ghibli has done before. Character designs and backgrounds are minimally rendered in a watercolour style – radically for hand-drawn animation, the character and background elements are often drawn on the same medium rather than drawn separately and then assembled. Together with another typically lush Joe Hisaishi score, Takahata’s film is ravishing and inviting, recalling traditional Japanese art without feeling derivative. And in a couple of the film’s most emotional sequences, the animators’ line seems to leave all constraint behind; becoming thrillingly expressionistic and even quasi-abstract. 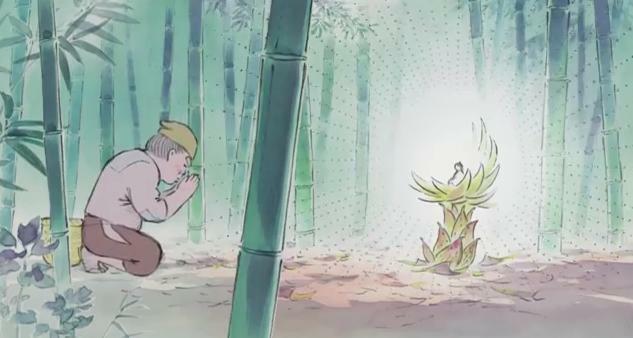 For pure beauty for its own sake, not many films can touch Princess Kaguya. Japanese audiences would not have been surprised by the last act of the film, based as it is on a 10th century folk tale that (sez Wikipedia) is the oldest extant Japanese prose narrative, and which has been adapted many times in every imaginable medium. 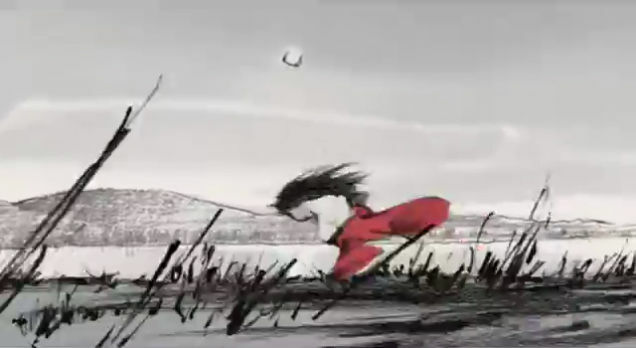 Most of the rest of us will be completely blindsided by it (Google not, if you don’t want to be spoiled), and not necessarily in a good way, as the delicacy and emotional directness of Kaguya’s story may not survive for many viewers when recontextualised by the revelations of the film’s closing stretch. The problem is that, for much of its running time, the power of Takahata’s film comes from forgetting its fantastic undperpinnings. What’s interesting and moving about Kaguya is the tension between her love for her parents and her struggle to resist being objectified and stifled so that they can realise their aspirations through her. She could be the protagonist of a film by the likes of Mizoguchi, and the fact that she was born as a tiny echo of her future self in a glowing bamboo plant recedes to a background white noise of unresolved metaphor. When her true nature reasserts itself, the peculiar gravity of that fantastical medieval story overwhelms, if not crushes, the impact of Takahata’s squarely modern psychological and social insights. This isn’t the first time I’ve felt that Takahata’s ambition has led him to have less than complete control of his material, and Princess Kaguya is a long and placidly paced film, not really aimed in its making at the young audiences it will be marketed to, but if the rumours are true and it is to be Takahata’s last film, his distinctively wayward voice will be missed. The Tale of the Princess Kaguya is on general release today.